Have you ever considered how to design a conference that is different? Many of us did 10 or so years ago. Tired of the typical 'sit and get' education events that were less than inspirational and did not leverage emerging technologies....boring! Change was in the air! Along came a group of educators, mostly based in China at the time, who decided it was a priority to design a conference that focused on the user, on the conversation, and on the learning. Hence the Learning2 conference was born in 2007 and has gone from strength to strength since. Moving from it's home base in China it has spread to Europe, Africa and South America with plans for more. If you believe conferences should be about connecting, collaborating and 'unintended' learning outcomes primarily through unconference sessions and extended workshops, this is one you MUST take a look at. 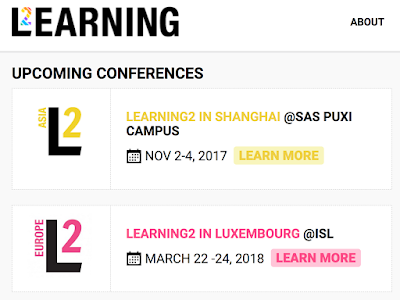 Although I missed the very first Learning2 event in Shanghai in 2007, I was there leading and presenting in 2008, 2009, 2010, 2011 and in 2012 was also active on the organisation team. This year, 2017 I am excited to head to Shanghai again for the Learn2Asia 10th birthday celebration as a Learning2 Leader. Will I see you there? The Learning2 story continues. This year the conference returns to the spot it all began: Shanghai, for the 10th year anniversary this November. Spots remain for those looking to take advantage of the diverse menu in motion: learn about the role that social media plays in a 21st Century classroom (more on that here), or build a culture of data-driven practice for your entire school (keep reading here), or help develop a program to better engage the parents in your community with best practice technology integration (click here for more). To register or find out what else is in store for to-be Learning2 participants this November, take a deep breath, get ready for a line-up of learning like no other and click here. 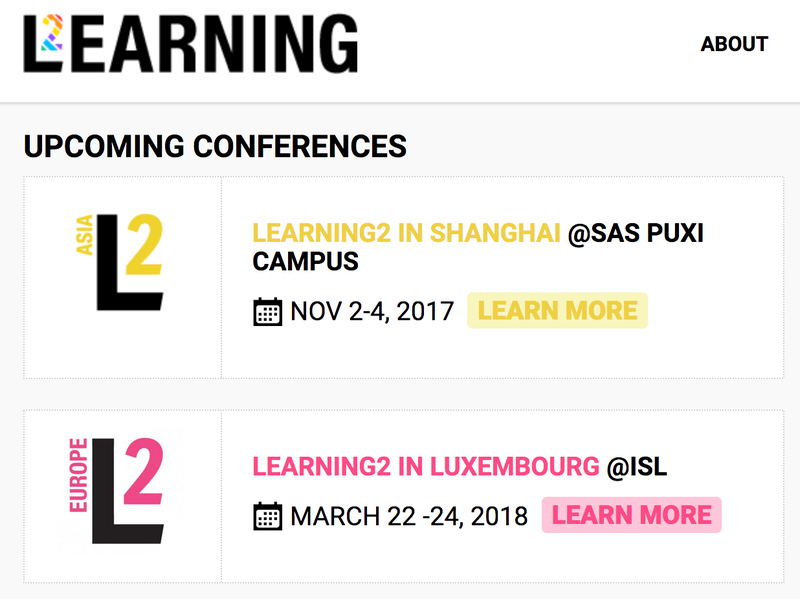 For those reading on the other side of the planet, you have more time to prepare to be wowed by Learning2 hosted in Luxembourg this Spring. Early Bird registration will officially launch in the middle of October, so watch this space for more. The L2 Advisory of four has become an operational L2 Team comprising eight educators from around the globe. Simon is currently based in Poland at the American International School of Warsaw. He runs the L2Europe team, oversees the technical operations of L2 and sits on the L2 Board. Madeleine is about to move to Brisbane, Australia having spent almost 10 years at the Western Academy of Beijing. She co-chairs the L2Asia conference and leads the educational vision for the conferences. Both Jeff and Kim are board members and will be L2Leaders in our L2Asia November conference. This is the 12th post in what is a regular series featuring the 36 case studies from my book, 'The Global Educator: Leveraging Technology for Collaborative Learning and Teaching'. This book was published by the International Society for technology in Education in July 2016. The book contains contributions from over 100 educators and case studies featuring over 50 educators.